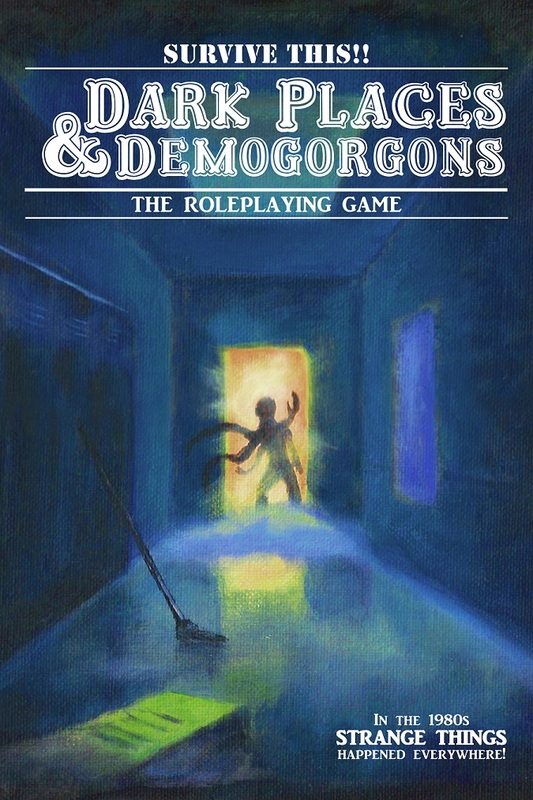 +Eric from Bloat Games was kind enough to send me over a pdf copy of his new game, "Dark Places & Demogorgon". Here is the elevator pitch from the back of the book. 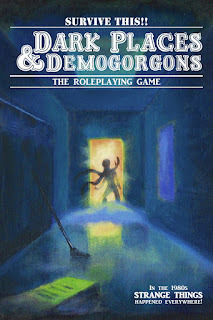 "Dark Places & Demogorgon is a tabletop roleplaying game that uses the original 1970s fantasy rules and mutates it into a retro nightmare that you hold in your hands. In DP&D you play as a high school student in the 1980s, the town you live in has had a rash of disappearances and strange happenings. The adults seem lost as to what to do, the police are as clueless as ever, and reverend Philips is on another witch hunt. It's up to you and your friends to figure out what's going on and stop if from happening again!" Heavily influenced by 80s pop culture, DP&D draws inspiration from movies like the lost boys, ET, Goonies, Weird Science, The Ghost Busters, The breakfast club and TV shows like Stranger Things, Erie Indiana, and Scooby Doo. This game is going to be fun. I think specifically if you have a group of players that all grew up in the 80s and get the theme of it. Which is pretty much most of the OSR audience (or atleast a reasonable amount of it). My 5e group would be at home playing this, my old school group all grew up in the 90s (so I might have to do a bit of explaining what a VCR is!). Eric and Co did a great job of game design. The mechanics of this game are similar to the original 70s version of "the world's most popular roleplaying game". The mechanics use S&W type rules, with d6s and 20s. Although there is a bit of fifth edition throw in for good measure (advantage/disadvantage). As well a few other sources. (the XP system is akin to DCC). First off, the book is fantastically laid out, great art that puts you right into the mix of the theme and general idea. There are even actual photos from year books (I'm guessing friends of Erics). You play the game as a teenager, and its basically race as a class. Specifically you can play classes like "The nerd, the athlete, the karate kid, the goth, the kid scientist, etc"). All of the classes have special little things they can do, and a few disadvantages I suppose. There is also a skill system (based on DCs) that is pretty cool. Not unsimilar to profiencies. The name of the game is really about mystery and role playing, it's not as combat heavy (which makes sense, as it would be a TPK a lot I think!). The experience system that was dreamed up works fantastically, giving players XP for participating, achieving goals, etc. It's similar to DCC in that we are not talking about having to get 1500 XP to get to level 2. The game comes with a baked in setting called Jtown (which is your small town in middle America in the 80s). Which could easily be any small town anywhere in the world with a bit of tweaking. There are examples of play, monsters, adventure ideas, sample characters, weapons and armour (including a trash can lid! haha). I really like the idea of being a player in this game, and going with a different character archetype than what I was in High School (ie I was a nerd, and I can play a dumb jock!). While reading the book, I thought about how to start a campaign. Obviously would depend on the characters in the game (for instance there are a whole bunch of backgrounds for the characters that you can roll, things like "being obsessed with D&D or my little pony, or mtv). But instead of the usual "you meet in a tavern", I thought "alright your playing D&D in some dudes basement". So the whole thing is like your playing a role playing game in a role playing game. You could even do it to your players during a regular fantasy game! hhahaha, that would be a trip. The premise of the game is somewhat similar to Crimson Dragon Slayer, as far as the 80s throwback references, and the immersion into that world. However it's gonzo on a different level, and a different game entirely. Eric is going to be running a kickstarter for this book, if your interested in it keep an eye on his youtube channel. At this point the book is laid out and ready to go, so it's probably going to be about getting the book in peoples hands. Here's Erics video showing off the book. Here's Ivanmikes review of the book.